eMachineShop makes it easy to design and order custom parts with powder coating. Powder coating looks similar to paint but is more durable. Powder coating is a process that “bakes” powdered plastic onto a metal surface. The coating is relatively hard and abrasion resistant. Powder coating adds typically 0.0025″ to 0.005″ to each coated side and edge. Textured powder is less susceptible to imperfections than matte or glossy. This metal finish is available in many colors. 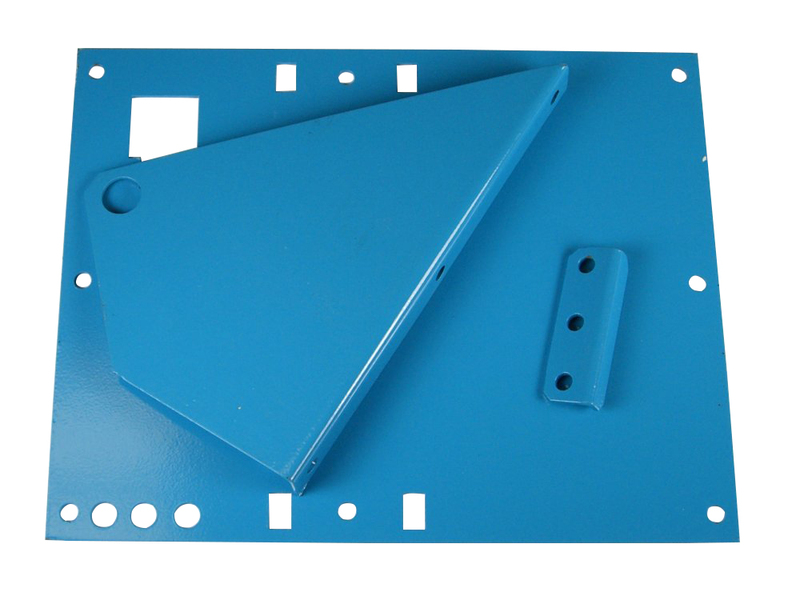 Applications of powder coating include: Custom Enclosures, Custom Metal Brackets, Custom Robot Parts, Custom Front Panels, Custom Sheet Metal Boxes, Custom Motorcycle Parts, Custom Auto Parts, Custom Toy Parts, Custom Knobs, etc. The metal finishinig process is most commonly applied to aluminum and steel. The are several factors to consider in designing parts with powder coating as a finish. Consider compensating for surface finish thickness – typically .001 to .003″ on each surface. Edges will be slightly rounded due to the thickness of the coating. Textured powder coat will hide scratches and abrasions better than glossy powder coat. Coating may not reach certain deep pockets and inside corners due to the electrostatic process. Mechanical finishing of surfaces prior to powder coating is not usually needed as the coating covers and smoothes the surface. Plain and tapped holes may acquire a small amount of powder which can sometimes interfere with threads. Redrilling or retapping can optionally be requested. eMachineShop offers powder coat finishing in numerous colors. The colors below viewed on your monitor or printed will vary from the true color of the actual powder coating due to computer system variations. For more accurate representation obtain a RAL color swatch booklet from https://www.ral.de/en. Powder coating provides a durable and attractive finish for a wide variety of purposes. *Actual colors may vary slightly due to monitor settings. If you have an existing part that needs powder coating see above. We can quote your job using conventional CAD files or you can use our unique free CAD software where you can: design your part quickly and easily, get instant pricing, and order online.